To be honest, I don't know how to feel about this book. On the one hand, it was a quick and engrossing read that I enjoyed; on the other, I thought its point--assuming it had one--was murky. As a twelve-year-old in the early '80s, Daniel is living in Chile with his family. One night, soldiers come in looking for his father, Marcelo. One of them points a gun at Daniel's head so his mother will tell them where Marcelo is. Daniel's father is arrested and taken to prison; soon after, he, his mother, and his sister leave Chile for Madison, Wisconsin, where Daniel's mother continues to fight for her husband's release from prison while going to graduate school and raising two kids on her own; and Daniel and Tina are pretty much integrated into American culture. Then Daniel's father is released from prison and exiled to the US, and their peacefull family life is shot to hell. One of the things that bothered me about Gringolandia is that the politics were presented in a laughably simple format. To tell the truth, there wasn't any politics in the book at all, unless you consider good v evil political. Considering Marcelo is a raging Communist (which made me wonder how the heck he got into the US, especially in the '80s) who is willing to put not only his own life but the lives of his children in jeopardy for his political beliefs, I find that a bit ironic. Even with the sympathy he garners for being tortured and his painful recovery, Marcelo is a tough sell as the hero of this tale. And he is the hero: it's his journey and his story we're told, while Daniel and Courtney, the two narrators, are merely sidekicks along for the ride. Which brings me to Courtney, Daniel's "gringa" girlfriend. She's an odd one. Her obsession with Marcelo is quite honestly a little creepy. I don't know about you, but if my s.o. started hanging out constantly with one of my parents and recording everything they said, and giving them back rubs, I would be bothered. Plus I felt that her storyline was left hanging and we were never given a conclusion to her side of the story. There were a lot of storylines left hanging, actually. Don't get me wrong, I did like most of the book. I liked that Daniel beat up a kid who was bullying his sister and was charged with assault for it. I liked Marcelo's response to the charges that his actions resulted in the deaths of several people (that was actually the point at which I started to warm up to him). And I loved the writing, which is very readable and drew me into the story even though there's not that much there in the way of plot. In a lot of ways, this book feels very personal, as if it's a diary, and it's hard not to feel involved with the characters. But the ending felt very anti-climatic and left me wondering what the point of the novel was--unless the point is that it's a good idea to give up everything--family, love, safety, morality--in pursuit of a political cause, which is bull hockey plain and simple and not something I can really get behind. Maybe if the story had been fleshed out more, or if I knew more about Chilean history (at this point anything post-1600 is pretty much a question mark in my head), it might have worked better for me. One review on Amazon mentioned that the situation in this book mirrors the one in Iran currently; my question would be, how can you even tell? The glimpse we're given of life in Chile and what Marcelo and the compañeros are fighting for is so brief and shallow that it's difficult to support Marcelo, sympathize with Daniel's decision to follow in his father's footsteps, OR to draw parallels to modern day. But then how can you do that with such a short book, right? 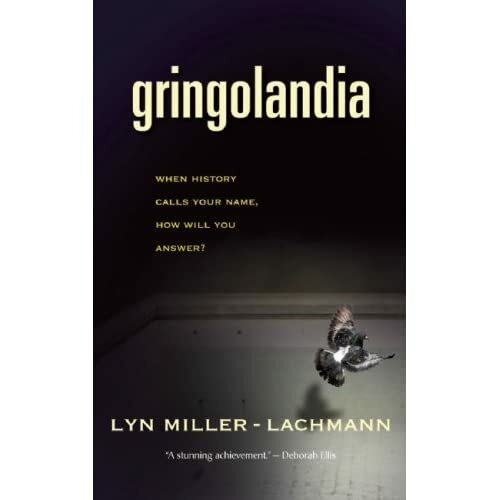 Gringolandia was a good novel, but I was expecting something different from what it turned out to be. *This is an Amazon.com Associates link. I will receive a super-small commission if you buy the book after clicking on this link. Also, I received this book from BronzeWord Book Tours. But they sent it to me by accident, so... not sure what that means.